Classics need updating now and then, right? 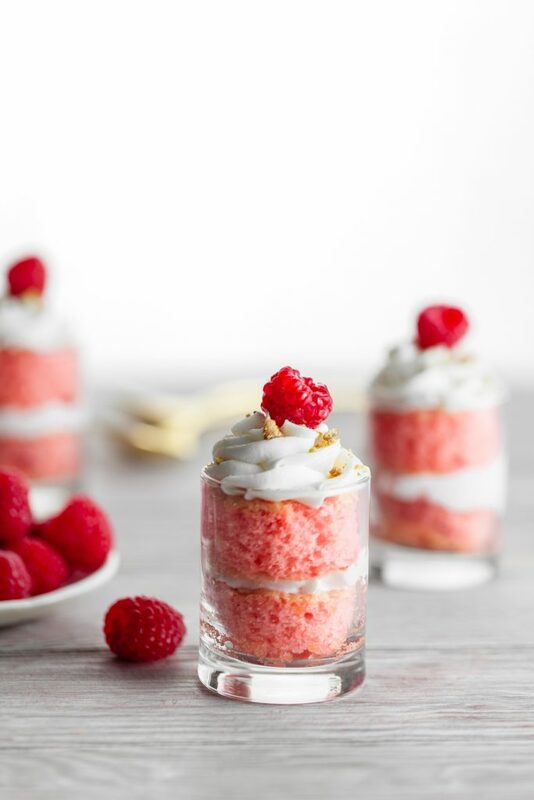 This raspberry tiramisu with white chocolate is a wonderful twist to this classic favorite. Line a rimmed baking sheet with parchment paper. With a handheld or standing mixer, whip the yolks with half the sugar until light and pale yellow. Whip the whites with the remaining sugar until soft peaks form. Fold the whites into the yold mixture. Add the pink food coloring, if desired. Spread the batter onto the prepared baking sheet and smooth so there is an even surface. Remove from the oven and cool. Once cool, brush with 1/2 cup of the Framboise. Combine the white chocolate and 2 Tbsp cream over a double boiler to melt and combine. Once melted, remove from the heat and cool. Whip remaining 1/2 cup cream to soft peaks. Whisk the white chocolate mixture into the cream until JUST combined. Do not overmix or it will become grainy. Chill. Cut circles from the cake using a 3" round cookie cuter. Place the circles of cake on a baking sheet. Layer the white chocolate cream on top of each circle of cake. Top the cream with chopped pistachios. Freeze the layers for about 30 minutes. Removed from the freezer and stack the layers on top of each other. With a spatula, cover the cake stack with a thin layer of cream, almost icing it like a cake. Top with the remaining chopped pistachios and fresh raspberries.